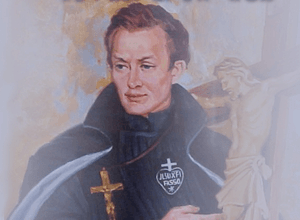 St Paul of the Cross was born the son of a wealthy merchant at Ovada, Italy. At 19, he decided to actively follow a religious life, having been influenced by the writings of St Francis and the teachings of the Capuchin Order. St Paul founded the Poor of Jesus Order, later to be called the Passionists. His brother was the first member of his new Order. The Order wore a black robe with a logo based on one of St Paul’s visions, depicting a white Cross and Heart. Inside the Heart were the words; “Passion of Jesus Christ”. Like all Passionates, St Paul devoted his life to solitude, prayer and meditation on Christ’s Passion and described it as his way, to an everlasting union with God’s love. The Passionates also established many retreat houses which they used to preach and spread Jesus’ message. St Paul’s Feast Day is the 20th October. Many of his original writings remain preserved today. Pray that through our meditation on the Passion of Jesus, we will reap a greater understanding of His teachings.